R. Eric Thomas. Photography by Neal Santos. 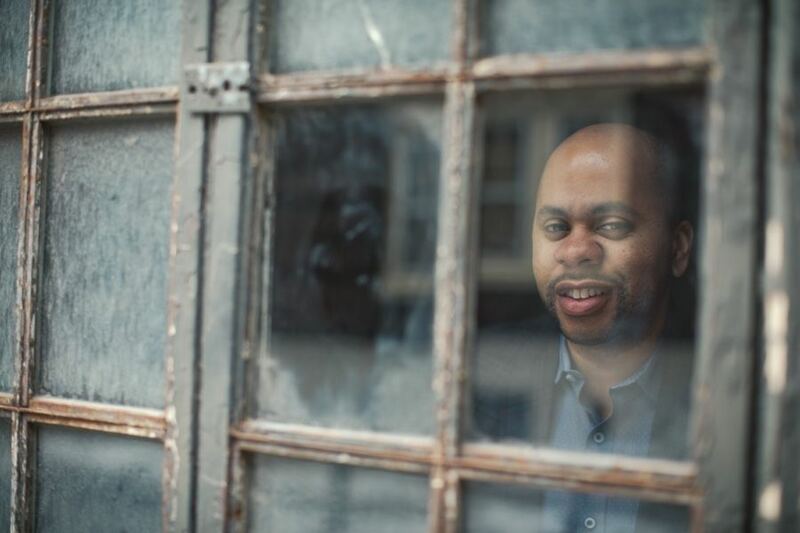 R. Eric Thomas is an award-winning writer whose work has been featured in Elle, the New York Times, Philadelphia Inquirer and many other publications. We chatted with the Barrymore Award–winning playwright on missing Philly, premiering his new play, Mrs. Harrison, at the Azuka Theatre, and how he deals with 20,000 Twitter followers. It’s been a while since we last chatted. How has life been? Wild. Like, truly out of control. I learned how to drive! A car! An automobile! A horse-less carriage. It has no horse and yet it moves through town. Remarkable! I also got married! Legally! Outrageous! And I moved to Baltimore! The city! From The Wire? Remarkable! I split my time between Baltimore, Philly, and New York. I write for ELLE.com full-time now, but they’re kind enough to let me work remotely. But, get this, I have a desk! In Columbus Circle! And it has a button that makes it higher and lower, so it can change from a standing desk to a sitting desk. That’s the most extraordinary thing that has happened in the last two years since we’ve last chatted for G Philly. I got a convertible desk I sit at once a month. Wild, honey. Extreme! Philly definitely misses you. Since living in Baltimore, what is the one thing about this town you miss back? I miss it all! I feel like that dude in Paris Is Burning, except instead of shouting “You! Own! Everything!,” I’m shouting “I! Miss! Everything!” Perhaps most of all, I miss the queer community. I’ve always appreciated how unique each locality’s queer community is and how deeply entrenched in a very specific history they all are. I got to see this firsthand while in Chicago recently for a production of my play Time Is On Our Side, which is about the Philly queer community. The history of queer life in Chicago is so different in so many different ways; it really highlighted how resilient and resourceful we are as a people, and it also drew into high relief how fortunate we are to have the community we do in Philadelphia. I continue to be awed by the work that people in all corners of the Philly queer community are doing, from the tireless Gayborhood performers to the Mayor’s Office of LGBT Affairs to the Black and Brown Workers Cooperative to the William Way Center and beyond. It’s an extraordinary community. Your latest play, Mrs. Harrison, premieres at the Azuka Theatre this week. What inspired you to go for what appears to be your most personal story? Yes, in many ways it is my most personal work. Aisha is probably the closest character I’ve ever written to myself, for better and for worse. I didn’t set out to write something that was about me, though. And, ultimately, it’s definitely not about me, but rather questions I have about how things work. I think a lot about what makes comedy work and what makes a story work. This play is an attempt to have a very technical conversation about the inner workings of art in a highly dramatic fashion. What inspired this? My addiction to starting drama while making jokes. Now that you’re followed by over 20,000 people on Twitter, what is the best and worst thing about being on the app? Best thing: connecting with literally everyone. I’ve had people I really admire slide into my DMs with invitations to collaborate or just compliments, and that’s incredible. I feel like when I have a question or need to find my community when traveling (or when I was still trying to make my way in my new home in Baltimore), Twitter was there. The other day, I was looking for children’s books featuring kids who were of mixed racial heritage or who had parents of different races, and Twitter came through big time. It’s incredible. Worst thing about Twitter: Literally everything about it. The conversations can be so reductive. The president is on it. It raises my hackles and lowers my melanin levels. The level of discourse that we as people settle for is dumb and that makes me sad. Twitter has the possibility of showcasing our best selves, but that’s hard, and sometimes we’re just our worst selves in public. Loud and wrong and heavily retweeted. But trying to be better. If you only had one solid piece of advice for those who follow you, what would it be and why? Oh, gosh, I don’t know. I have a lot of opinions, but most of them are incorrect. My favorite season of The Wire is the second, and that’s clearly wrong. But, one piece of advice I’ve been chewing on this week is how important it is to right-size others and yourself. I believe in having heroes; I believe in putting confidence in the abilities of others, but we’ve got to stop treating people as if they are infallible. Right-size your heroes. Right-size Beyoncé. Right-size yourself. We’re all just people. Some people are people of extraordinary skill and prodigious talent, but if you forget those people are just people, you risk getting your feelings hurt or winding up angry when you don’t need to be. The same is true of the way we think of ourselves. I expect a lot of myself; I beat myself up. I struggle to see myself in context. But when I’m able to, I can allow myself some grace, I can give myself a good coaching, and I can get a lot closer to the version of myself that I want to be. Azuka Theatre’s world-premiere production of R. Eric Thomas’s Mrs. Harrison runs at the Louis Bluver Theatre at The Drake, 302 South Hicks Street, from May 2nd through 20th. All performances are pay what you decide.